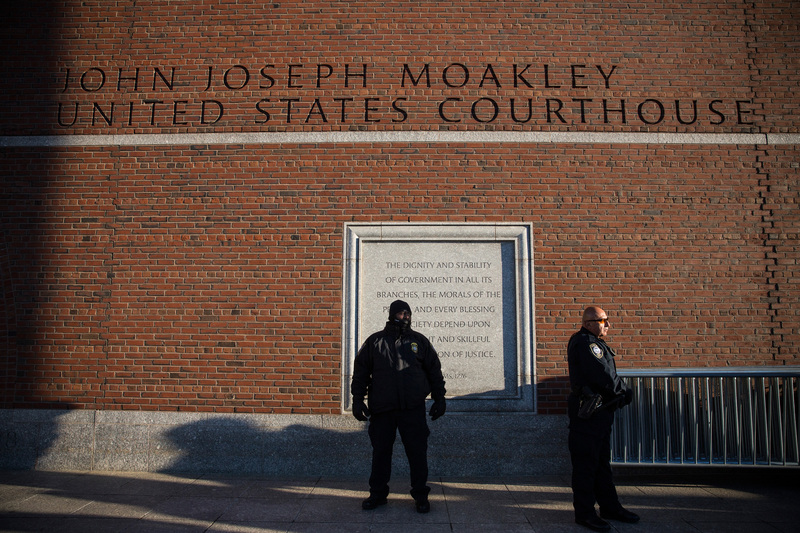 On Monday, the jury is set to hear closing arguments in the trial of Dzhokhar Tsarnaev, the alleged bomber who's accused of placing one of two bombs near the finish line at the 2013 Boston Marathon. These final arguments from both the prosecution and the defense follow an emotional week that offered a new yet chilling look into the bombings, which killed three people and injured more than 260 others. Tsarnaev, who was just 19 years old when the bombings took place, is facing the death penalty for the 30 counts against him. He has pleaded not guilty. Because he's facing the death penalty, the jury will have two deliberation phases: one to either find him guilty or clear him of those 30 charges (17 of which carry the death penalty), and a second phase to decide his fate. The jury must be unanimous in its decision to sentence Tsarnaev to death. According to The Boston Globe, there can be no mistrial in this case. If the jury is hung, then the judge will most likely intervene and sentence Tsarnaev to life in prison. With the death penalty hanging overhead, Tsarnaev's defense team, which includes noted public defender Judy Clarke, has been trying to plant the seed of doubt in the minds of the jurors. Last week, the defense brought just four witnesses to the stand, wrapping up their examination in less than two days. Despite pleading not guilty, Tsarnaev's lawyers have not disputed his guilt. Although Clarke reportedly told the jury, "it was him," in her opening arguments, the defense attempted to show the Tsarnaev wasn't the mastermind behind the gruesome 2013 bombings. The defense argued Tsarnaev was under the influence of his older brother, Tamerlan, who was killed on April 19, 2013, in a shootout with police. Now, the defense must again shift the conversation from Tsarnaev's alleged premeditated bombing to the possibility that he was forcefully swayed by his older brother to participate in the April 15, 2013 attacks. Last week, the defense questioned witnesses who gave an alternate explanation of certain events and details, including counter explanations to Tsarnaev's alleged purchasing of pressure cookers and ammunition. Clarke, too, has a long track record of "saving" clients. She's previously represented Ted Kaczynski, known as "The Unabomber," and Jared Loughner, the gunman who attempted to kill Rep. Gabrielle Giffords in 2011. But the defense also had a tough uphill battle, considering that emotions over the 2013 bombings still run high in Boston, a close-knit city where residents are not only resilient, but fiercely loyal and protective of their own. "This is a very difficult one, no question about it," Lesley "Lee" Coggiola, an attorney who worked with Clarke, recently told the Los Angeles Times. He mused to the LA Times that this may be the first time Clarke can't save her client from the death penalty.